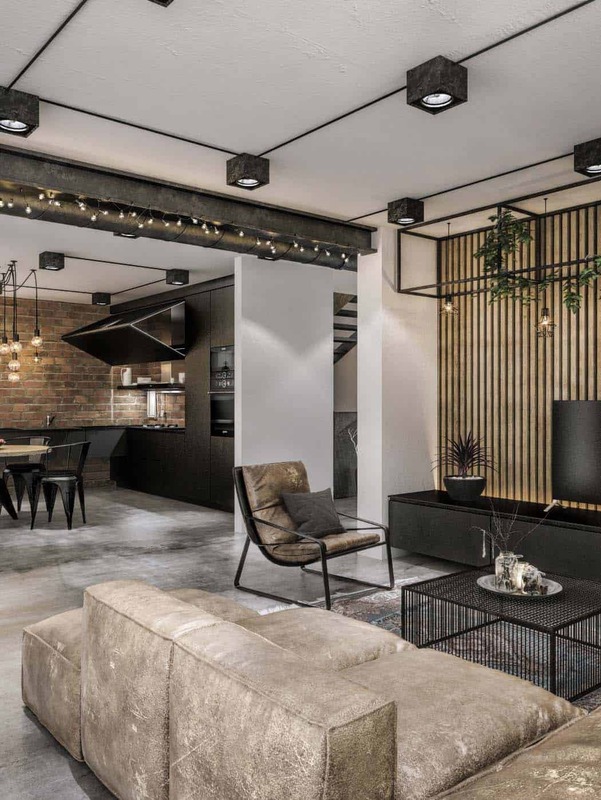 This spectacular modern loft with industrial influences throughout was recently renovated by interiors studio Idwhite, located in Kaunas, Lithuania. The home is located in an old historical building, in need of a major overhaul. 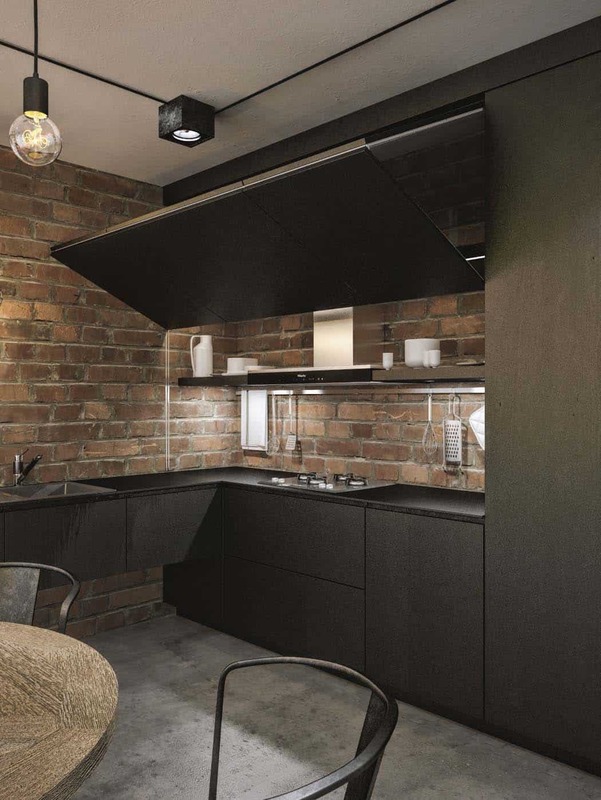 The interiors are characterized by exposed ductwork, exposed brick walls and rough concrete flooring. 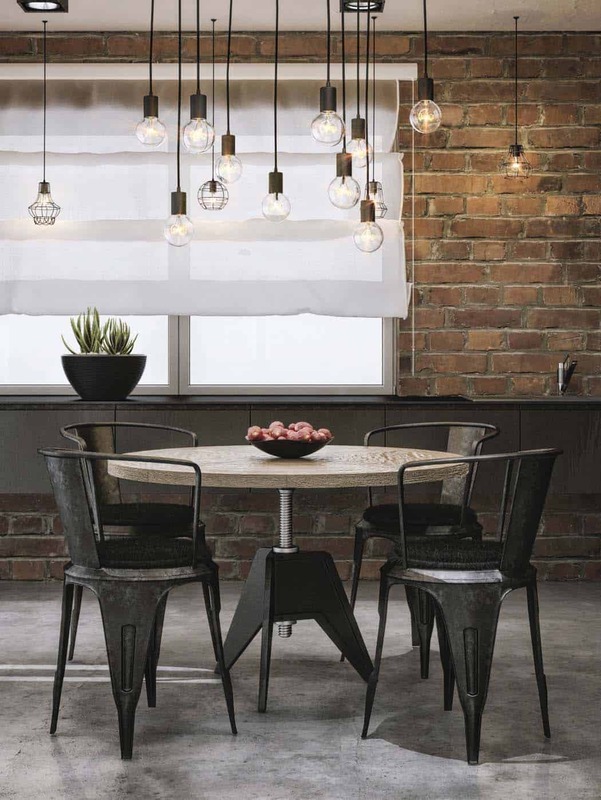 Modern furnishings decorate the home along with industrial light fixtures. 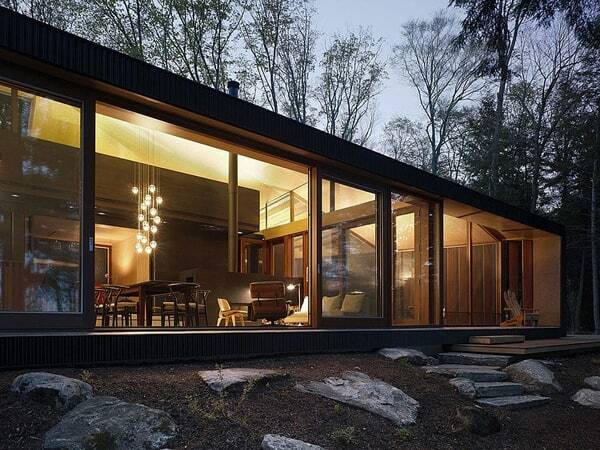 An open layout helps to create a nice flow from one space to the next. 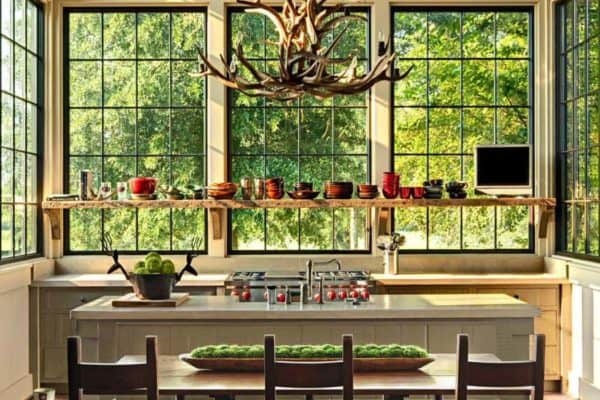 The kitchen was designed to be open and spacious, where the dining table easily nestles into the room. Open to the living room, entertaining guests is a breeze in this home. 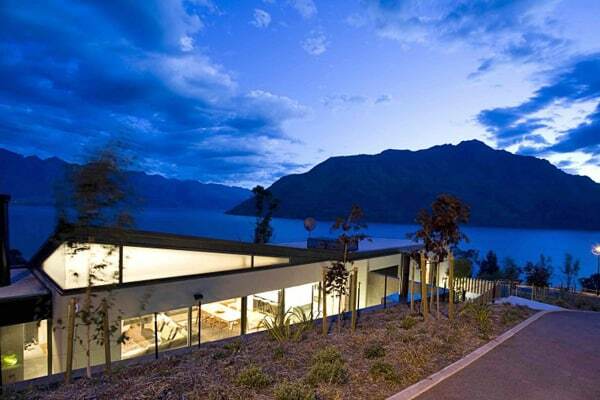 This is the ultimate bachelor pad, with sleek finishes and ultra-modern, posh furnishings. 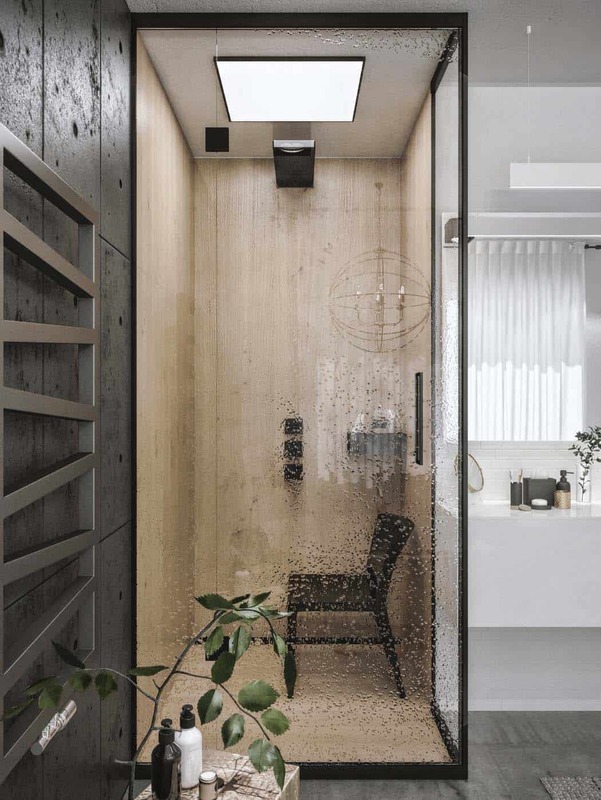 What We Love: Although this home is minimalist and modern, warmth can be felt with the use of leather fabrics, woods and brick on the walls. 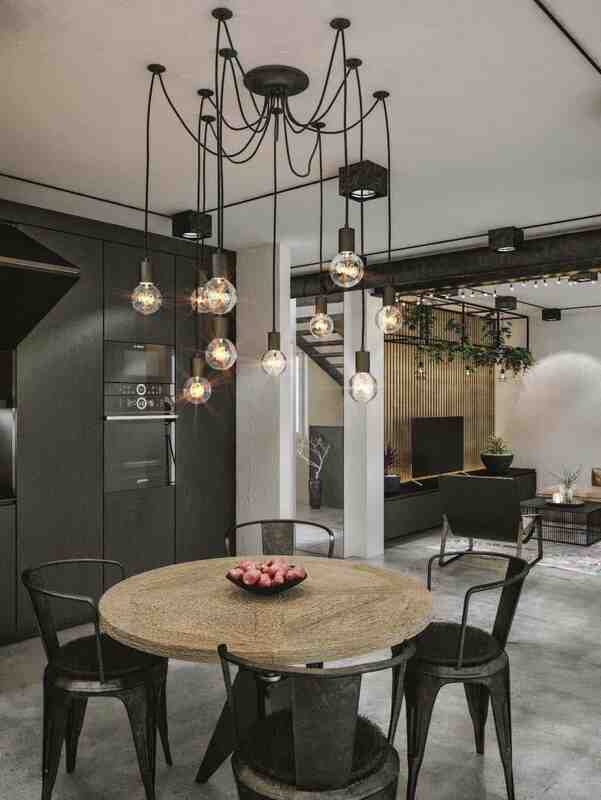 The bulb light fixtures throughout the home adds to the industrial aesthetic, strung at varying lengths, they help to add interest to the space. 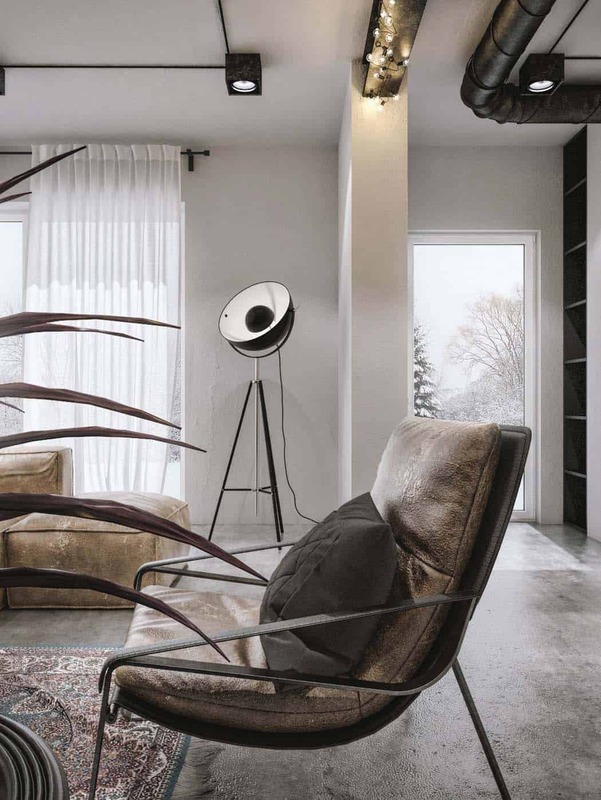 A layering of textures also adds to the visual interest. This is a fabulous looking loft with exquisite furnishings and plenty of detail. 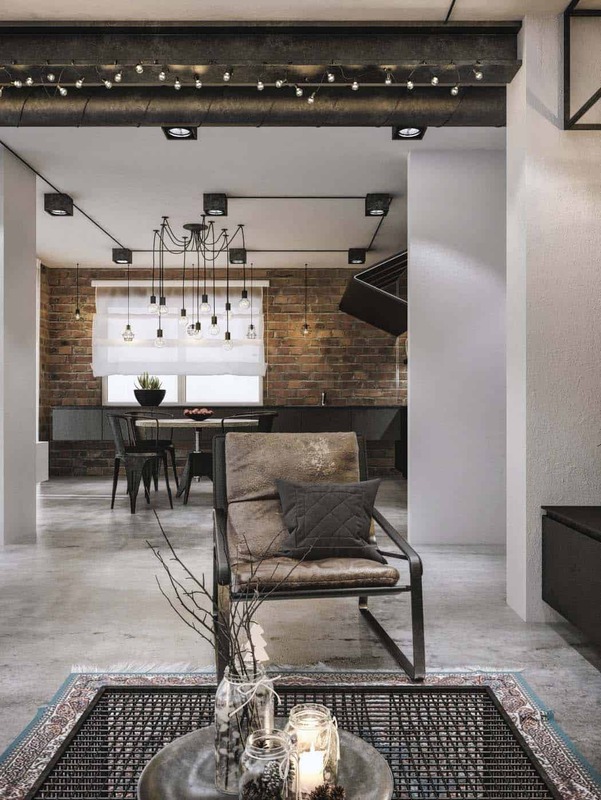 Readers, what do you think of this industrial loft, do you find the overall look appealing? Let us know why or why not in the comments below. 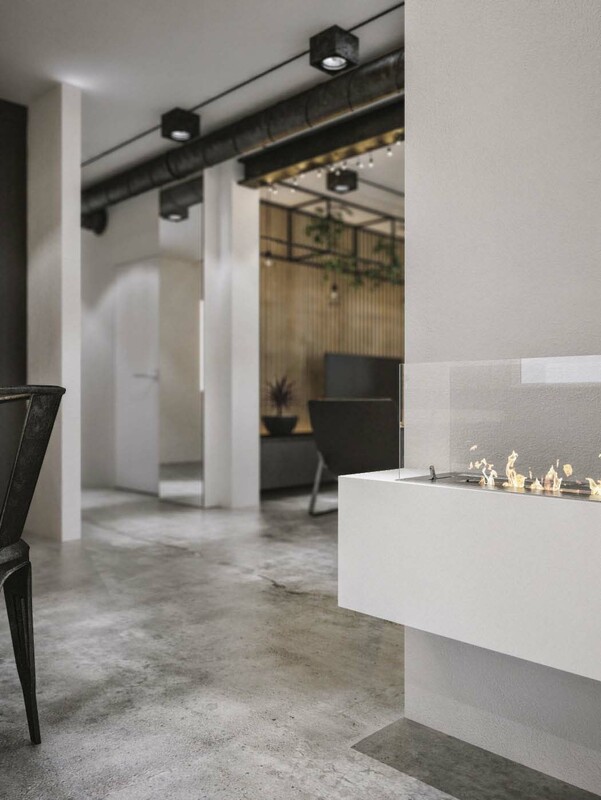 Above: An ethanol fireplace adds some warm ambiance to the space. These fireplaces are very versatile. They are vent-free and can be be added to any room in your home, which is perfect for loft and apartment living. They are also small and lightweight, which makes them easy to move around. 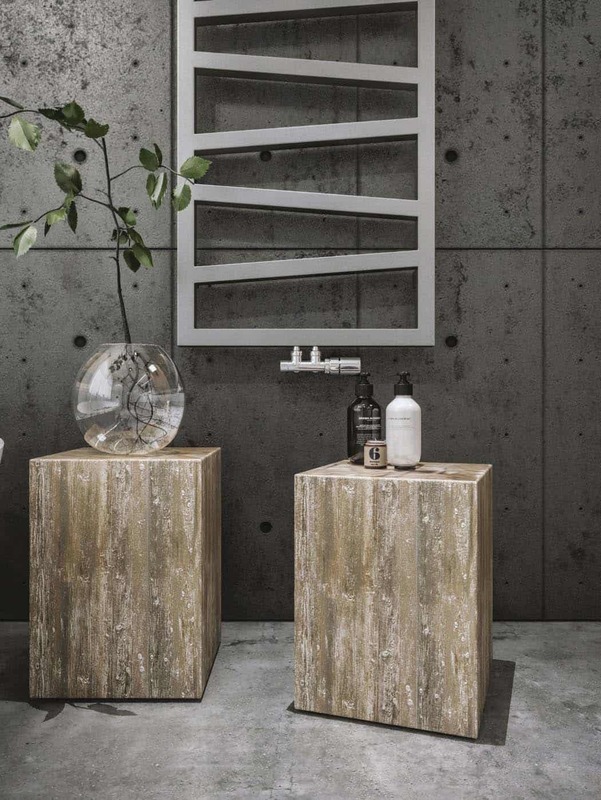 This can help you to easily change the look of any space in your home. Above: A metal perforated guardrail adds to the dramatic aesthetic of the blackened steel staircase. An industrial light fixture is suspended from the center of the stairwell of exposed hanging light bulbs. 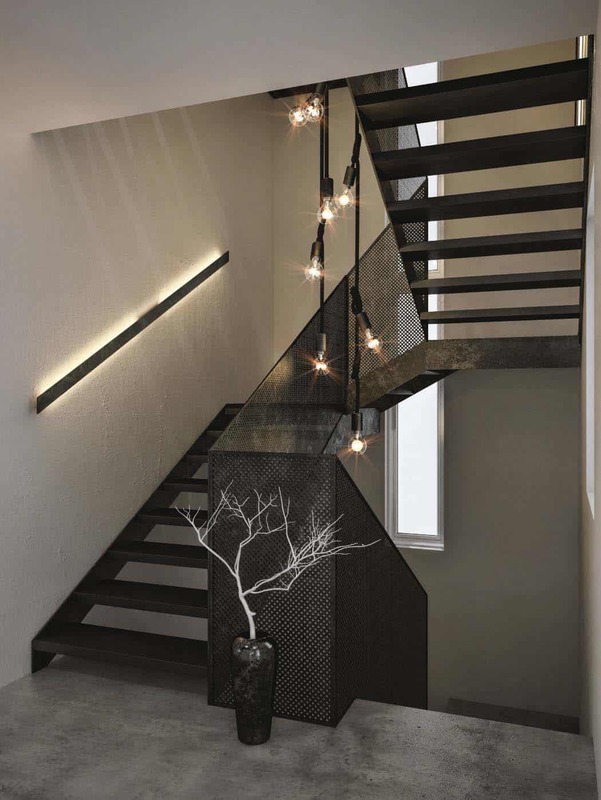 The handrail mounted to the wall is illuminated by LEDs, adding to the drama. 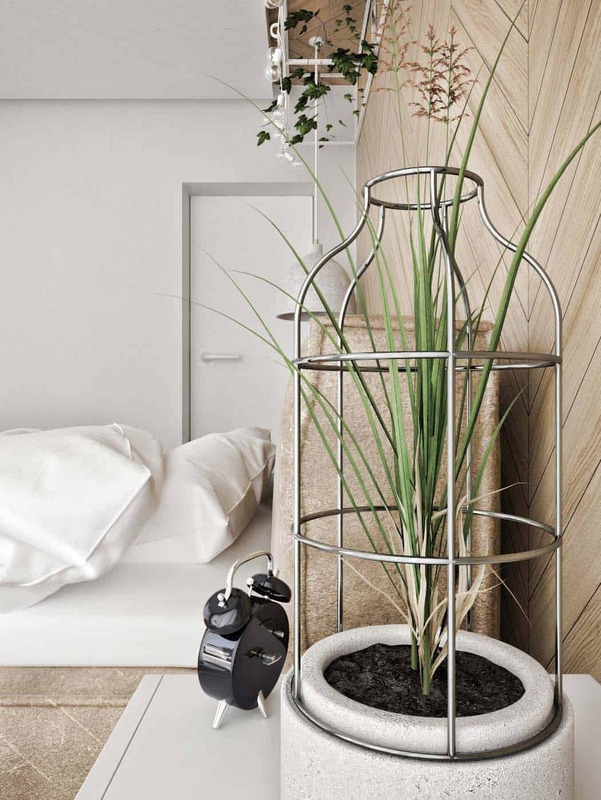 Above: The master bedroom features a leather platform bed, adding to the modern aesthetic of the interiors. 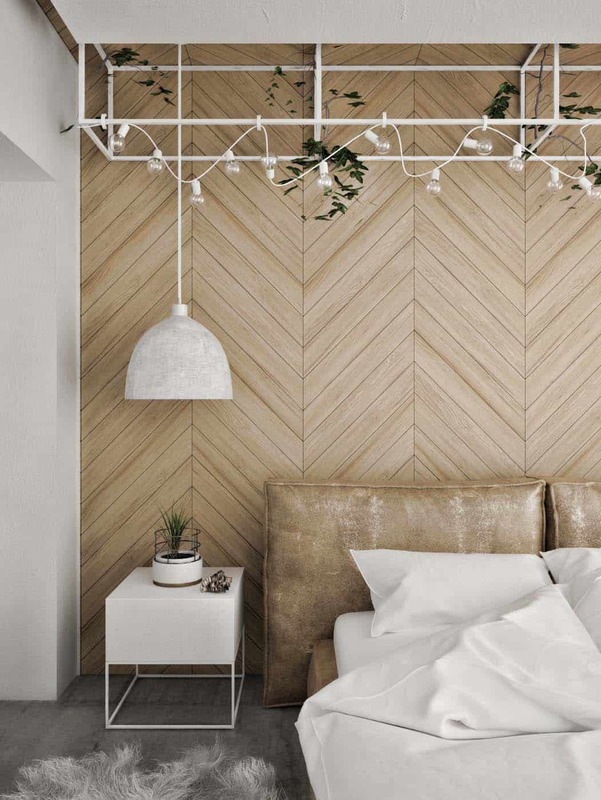 A floor-to-ceiling accent wall behind the bed is comprised of wood in a herringbone pattern. 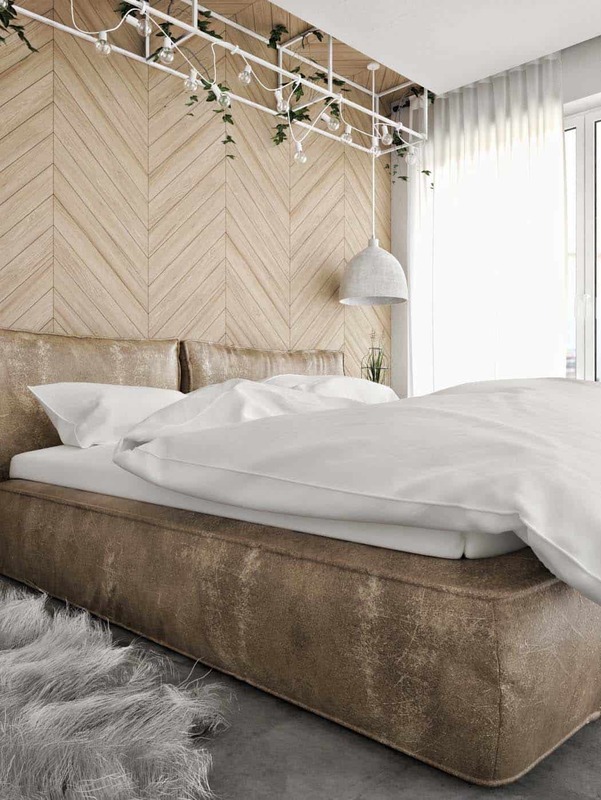 Texture is added to the space by a furry area rug next to the bed. 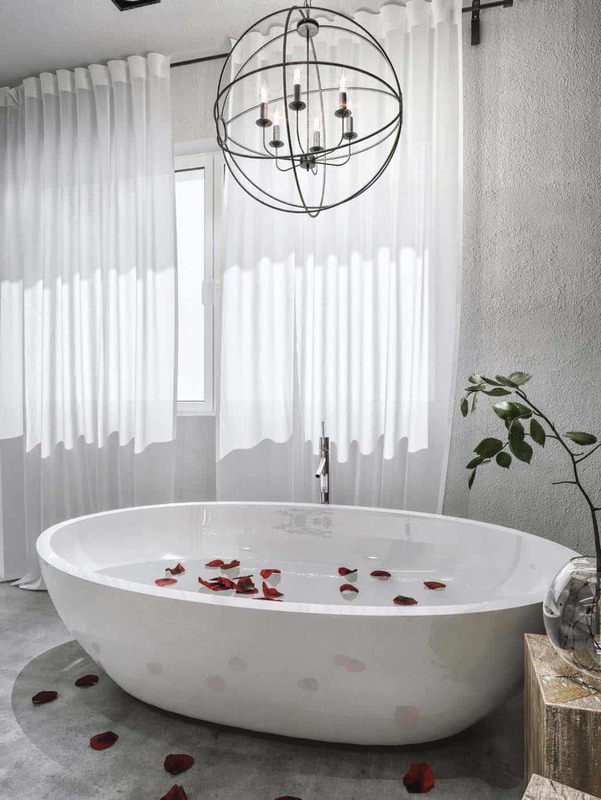 Above: An inviting spa-like bathroom feels like an oasis with its freestanding soaking tub and glass-enclosed shower. 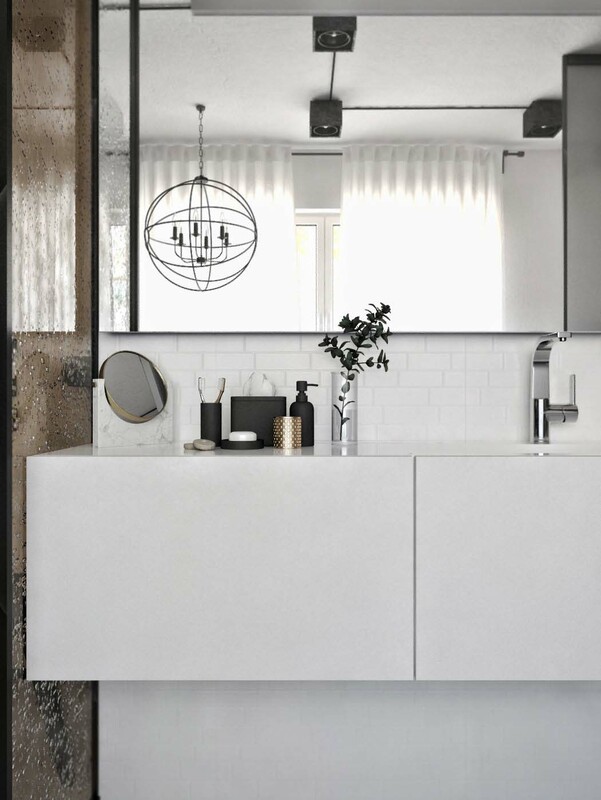 Concrete floors and a wall of concrete makes this space feel more minimalist. 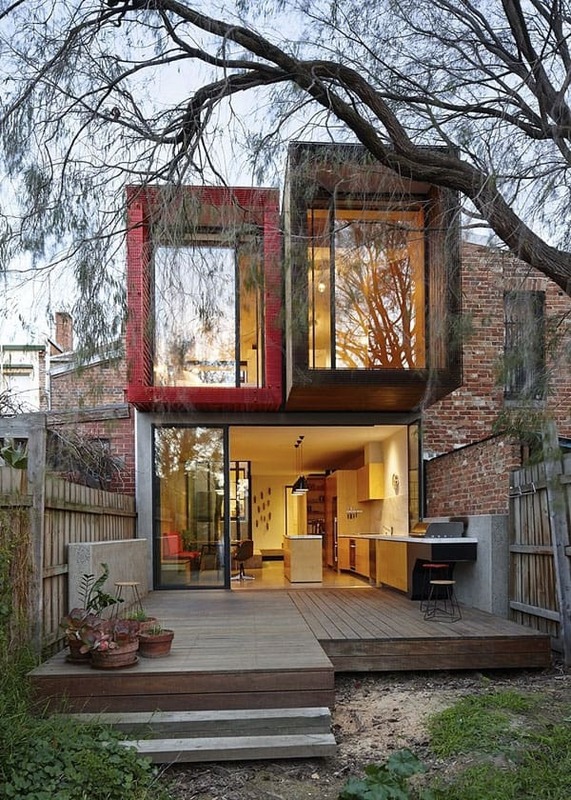 Hi there, congratulations the house looks really amazing, love the industrial look. I just want to ask you about the black square spotlights. 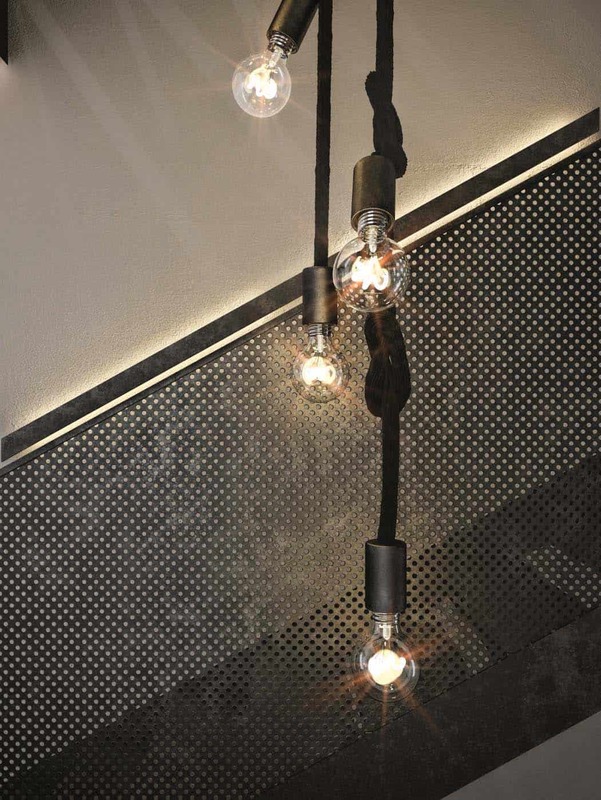 Where can i find something similar (e.g thin rail wire with square spotlights)? Or what is the name of this kind of celling?? Thank you. Evi, the source of the light fixtures was never given, but a close match is the “Amerivent Chimney Roof Support, 3 Wall, 8”. Hope this helps! !